The problem with TechCrucnh stories is that they never get the effing analysis right, so lets go to the source instead. In this case its the code author of Car Locator, A AD2 winner. If you view the full blog of posts, you see symptoms of advertising in that after the AD2 win the uptake in sales starts occurring. But we have to know why. First int, Edward Kim provides a free version of Car Locator and the conversion rate to paid is about 9%. The only advertising he has at the moment was 3rd place AD2 winer and Android Market featuring his application. In other words his advertising effort is not there yet or put another way only half complete. Let me explain. On the iPhone side an app developer will make a full version freely accessible to reviewers by using a timer to time out the application use past a few days. 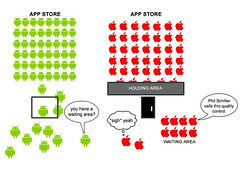 That way you lower the barrier to having all mobile application reviewers review the application and write their application review for the blog reviewing it. Thus, the take away points seem to be use the free application to lower the barriers to having the application reviewed and featured by internet media and that Android devices deployed on Verizon helped. One thing that is the same in skills and processes with the effort to get sales in Android Market is something that may at first glance might not seem related,androd development consulting customers. You have the same process of analyzing where that target audience might look on the web and attempting to grab that audience. Suffice it to say that free demos and free videos are like the resume to get that Android Application Review site to review your application and thus that review becomes a marketing tool to get new customers. Just like the recruiters on Linkedin, you have to avoid spending time on those groups that are not tangential towards your goals of getting customers. In the Android Market case, coverage by a non android application review site will only matter if the audience is directly using Android devices in high numbers. But what free applications? It has to be a free android application that attracts an android application review site to review said application. Top sellers at this time seem to be Games, Entertainment, Utilities, and feature rich AppWidgets. The free applications I am finishing are at this time an AnimatedWidget, a Feeds Application, a game, and a file browser application. notice that I did not state free android applications with someone else’s brand on it? At this point you will want your brand on it and that brand pointing to your stuff.